Koihime†Musou: Gunyuu, Seitoukaichou no Za wo Neratte Aiarasou no Koto - Ato, Porori mo Aru yo! The equivalent of Huang Zhong. A skilled Archer with great eyesight and incredible skill in Archery. She is a noble woman who loves her daughter Riri. In the anime, her daughter was kidnapped by bandits and they tried to force her to assassinate an official that had been cracking down on bandits. Kan'u and her friends rescued the child before the assassination could take place. 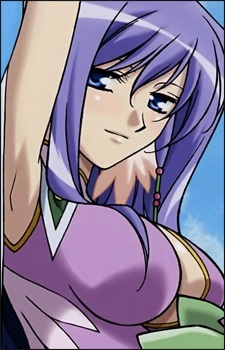 She later joins Kan'u's group as a way to repay the debt she feels she owes. Her daughter, Riri, was kidnapped by Enshou's men to make Kouchuu fight Kazuto's army. Thanks to Chou'un Kazuto's group rescuing Riri and returning her to Kouchuu, she sees how Kazuto is a good person, and she offers her services to him to fight at his side. She loves Kazuto and teases him frequently.